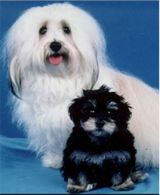 Havanese puppies and Havanese dogs are natural companions. They are intelligent and responsive and become very attached to their humans, and they are really good with children and other household pets. 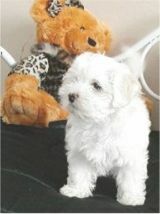 Havanese puppies are cheerful and sociable little dogs like a position high up on a chair watching what is going on! After the French, Cuban and Russian revolutions, Havanese dogs became almost extinct. The breed remains rare in Cuba, but is on the increase elsewhere due to the efforts of some very dedicated believers in the breed. In the 18th and 19th Century they were 'lap' dogs, adorning laps of aristocracy .